In section 1.3.1 it was identified that the oceans store an immense amount of heat energy, and consequently play a crucial role in the regulation of the global climate system. In order to explain the observed hemispheric synchroneity of glaciation, despite periods of directly opposed orbital forcing in the two hemispheres (see section 2.5.2), many researchers have looked to the oceans. 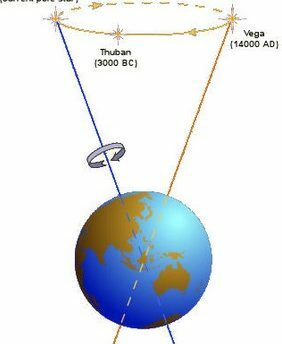 Although, in this sense, changes in ocean circulation could be regarded as feedback resulting from orbital forcing, ocean circulation has traditionally been viewed as an internal forcing mechanism in its own right. At present, northern maritime Europe is warmed by heat carried polewards by the Gulf Stream. 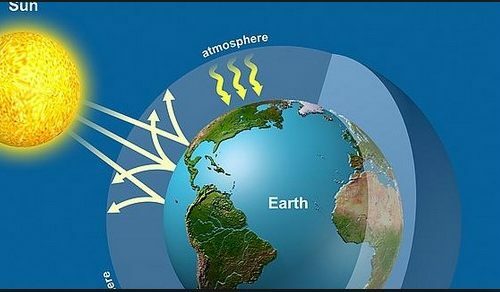 When the warm water meets cold polar air in the North Atlantic, heat is released to the atmosphere and the water cools and sinks. This is assisted by the increases in salinity (and therefore density) that occur when sea ice forms in the Arctic regions (see sections 1.3.1 and 1.3.2). The bottom water so formed, called the North Atlantic Deep Water (NADW), flows southward through the western Atlantic, round Southern Africa and Australia, and then northwards into the Pacific Ocean. The North Atlantic is warmer than the North Pacific. The increased evaporation there therefore serves to increase salinity, relative to the North Pacific. This salinity gradient is thought to drive the global thermohaline ocean circulation. Such a picture of thermohaline circulation is schematised in Figure 2.6. A number of the theories which have been put forward concerning the role of the oceans in the processes of climate change invoke changes in the rate of NADW production and other characteristics of the thermohaline circulation. Most attention has focused on the climatic transitions between glacial and interglacial episodes. It has been suggested that during a glacial period, the formation of the NADW is much reduced or even totally shut down. At these times, the Arctic ice sheets extends much further south into the North Atlantic, pushing the position of the polar front southwards. Cooler sea surface temperatures reduce evaporation and therefore salinity, further precluding the initiation of a thermohaline circulation. The concomitant absence of the warm surface Gulf Stream could result in northern Europe being 6 to 8C colder than during interglacial times (i.e. at present) (Broecker, 1987). The causes of the changes between the glacial and interglacial patterns of thermohaline circulation would then be seen as internal climate forcing mechanisms. 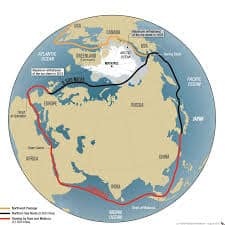 Indeed, Broecker (1987) has proposed that salinity changes between the North Atlantic and North Pacific may be so great that the entire global thermohaline circulation could be reversed. Such a theory of mode changes was developed in order to explain the rapid (<1,000 years) post-glacial climatic fluctuation of the Younger Dryas event about 11,000 years ago (see section 5.3.2.1), when the North Atlantic appeared to cool by several degrees (Dansgaard et al., 1989). Modelling appears to confirm the existence of at least two stable states of the thermohaline circulation (Manabe & Stouffer, 1988). Rapid transitions between these two states, and the corresponding climatic flips between glacial and interglacial periods, in response to internal forcing, would then be non-linear. Nevertheless, empirical evidence in support of mode changes is still inconclusive. Broecker concedes, however, that the shutdown of the North Atlantic ‘heat conveyor belt system’ alone would not be sufficient to initiate global temperature changes and ice sheet development (Broecker & Denton, 1989). 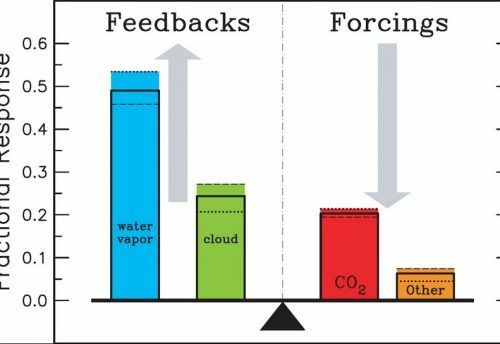 Other internal feedback mechanisms would need to be invoked, for example changes in the concentration of greenhouse gases and aerosol loading, together with reduced ocean heat transport and increased ocean alkalinity. From the foregoing discussion on ocean circulation, one could conclude that such a mechanism of climate change should really be regarded as non-radiative (see also section 2.6.2, Figure 2.4), since what is at issue here is the transfer of energy within the ocean component of the climate system only. It is perhaps the resultant feedback processes identified in the preceding paragraph that allow most scientists to regard this mechanism as a radiative one.